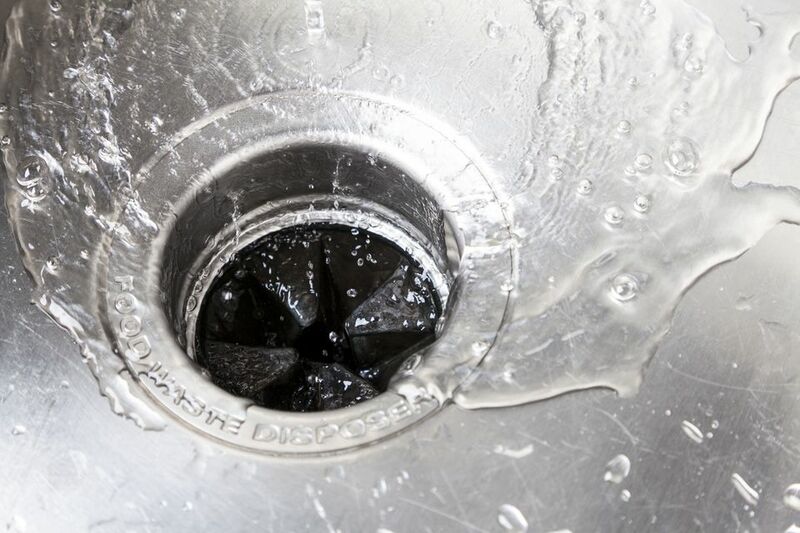 Cleaning your garbage disposal can help prevent and remove foul odors, and some cleaning methods can also help keep the kitchen drains clear. When the kitchen sink starts giving off bad smells, it’s a sure sign that the garbage disposal and drains could use some cleaning. Garbage disposals generally do a great job of cleaning themselves, effectively breaking up the food particles and sending them down the drain, so the chamber inside the disposal remains relatively clean. But over time, a stinky slime tends to build upon the areas that don't get scrubbed by the grinding action of the disposal. These are the undersides of the rubber baffle at the drain opening and the smooth, sloped area at the top of the grinding chamber. Weekly cleaning can keep the garbage disposal clean and free of smells. ﻿Turn off the power to prevent the disposal from being turned accidentally on while you are cleaning, even though your hand shouldn't be near the grinding "teeth" at the bottom of the chamber. Unplug the disposal from the outlet under the sink, or turn off the disposal's breaker in your home's service panel (breaker box). Apply dish soap to an abrasive sponge and scrub under the baffle—thoroughly—to get all into all of the folds and creases. Rinse the sponge frequently to remove all gunk. Swipe around the top of the grinding chamber. Again, rinse the sponge frequently. Repeat until the sponge pulls up no more gunk and the disposal surfaces feel clean. If you do nothing other than clean these two key areas, you'll probably be in great shape. But if you want to take one more step and freshen the disposal and drain pipe a bit while you're at it, then try one of the following cleaning tricks. Homemade disposal and drain cleaner made with baking soda and vinegar can help to clean the chamber of the garbage disposal as well as the top of the drain pipe. Pour 1/2 cup of baking soda into the garbage disposal, then slowly and carefully pour 1/2 cup of vinegar into the disposal. Place the sink stopper over the drain opening. The mixture of baking soda and vinegar will fizz up like a kids' science class volcano (it's the same "lava" mixture). The sink stopper traps the fizzing baking soda inside the disposal. Wait a few minutes, then remove the stopper and flush the disposal with hot water while running the garbage disposal. If the sink has two basins, the cleaner will work best if both sides are cleaned at the same time. Use the same amounts of baking soda and vinegar in the other sink drain. Ice and either rock salt or vinegar are also great for cleaning a garbage disposal. The ice helps to scrape the inside of the grinding chamber, dislodging any buildup. Fill the disposal with ice cubes. Pour a cup of salt or vinegar into the disposal. If the disposal is really smelly, or you have tried other cleaners and still get a foul odor, you can use a diluted bleach solution of two parts warm water and one part bleach. Don't use more than 1/3 cup of bleach, and wear gloves when pouring into the drain. After pouring the bleach solution into the drain, run warm (not hot) water down the drain for several seconds. Using citrus peels is another popular way to freshen up a smelly garbage disposal. The citrus oils in the peels certainly add some fragrance to the air, but the fact is, the peels do little to clean the disposal, and they do nothing to get rid of those slimy areas (which you've hopefully already cleaned with a sponge). To give your disposal a little spritz, grind a small handful of citrus peels (cut into small pieces) in the disposal with cool water. If desired, you can also add a few ice cubes. The citrus oil can give the disposal a pleasant smell that lasts a little while. Keep in mind that this freshening method works best on a relatively clean disposal.